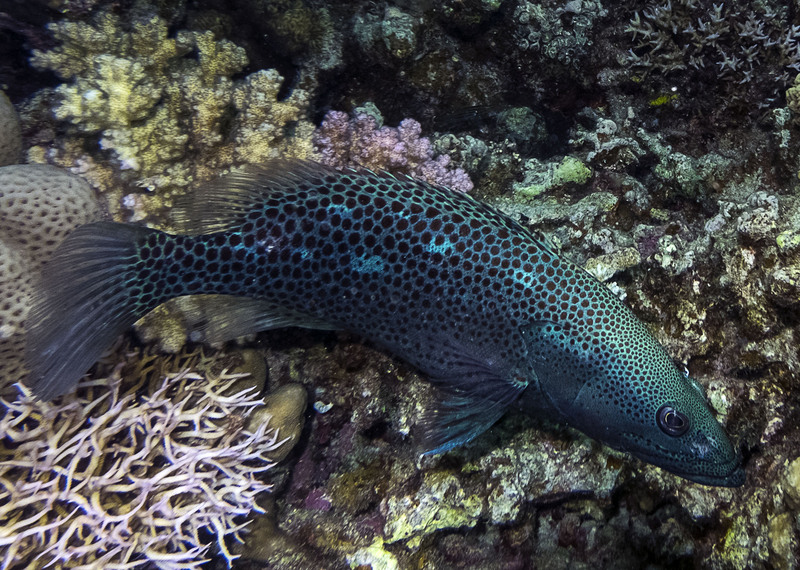 The Cobalt Slender Grouper (Epinephelus leucogrammicus) is an exceedingly rare and beautiful fish known only from the Red Sea. 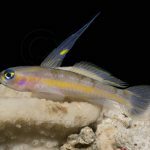 Rarely collected for the aquarium trade, specimens often fetch thousands of dollars when they are made available. 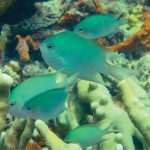 Given how infrequently this fish is spotted, both in the wild and captivity, it should come as no great surprise that relatively little is yet known about its biology. 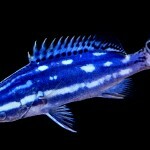 One of the most important questions concerning it (particularly for those aquarists who are considering purchasing one of these pricey piscines) is whether the attractive blue coloration of the juvenile is retained into adulthood. Now, perhaps for the first time ever, we have a photo of a mature specimen, which seems to indicate that the gorgeous cobalt hue is a permanent fixture. The photographed specimen shown here, estimated to be roughly 30cm in length, was observed off the coast of Hurghada, Egypt in the Northern Red Sea at a depth of just 15 meters. 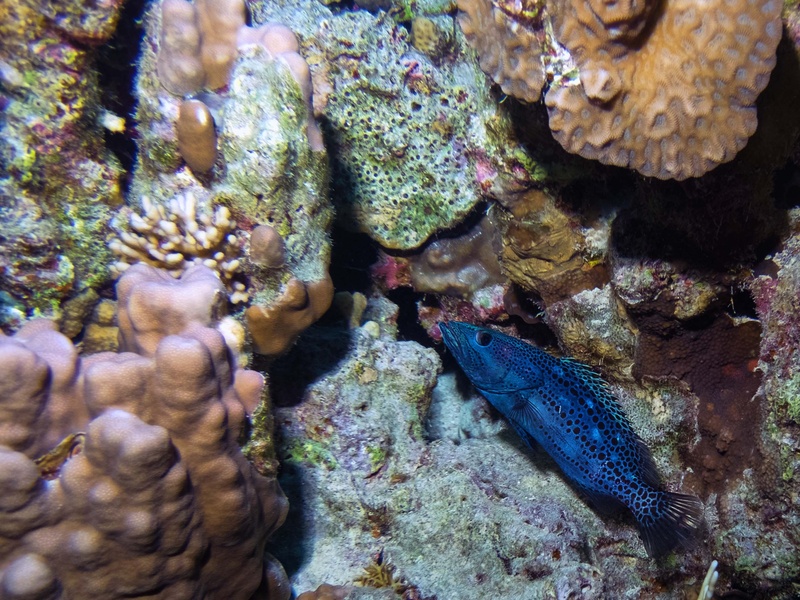 This is shallower than many previously observed and collected specimens and likely indicates that this fish has a broader range than has been appreciated, perhaps occurring in the very shallowest portions of the reef. Still, it’s clear this is a very uncommon phenotypic variation for E. leucogrammicus. 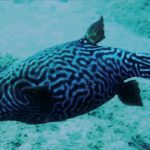 Diver Rob Atherton, who photographed this specimen, shared that the dive guides had never seen any others previously in the twenty years they have been exploring these reefs. We still don’t have any clear hypotheses for why there are blue specimens of this normally brown fish. 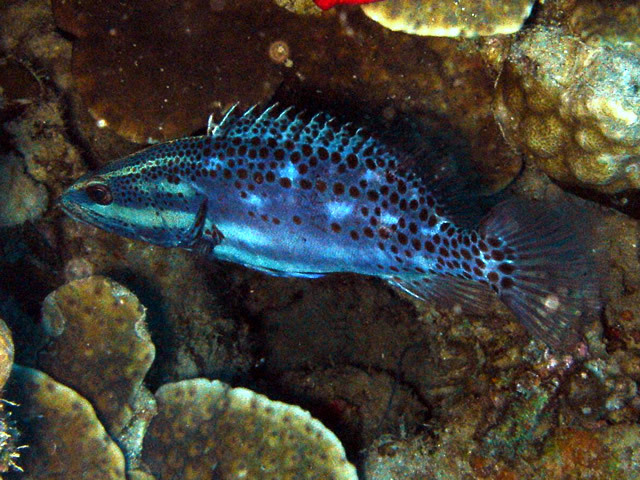 As I suggested in my previous discussion, specimens from elsewhere in the Indo-Pacific are very convincing mimics of certain Halichoeres wrasses that occur in these portions of its biogeographic range, so it is plausible that the blue hue is indicative of what this grouper looked like earlier in its evolutionary history when they may not have yet developed their mimicry. Alternatively, it may just be a recessive mutation resulting from the isolation the Red Sea has experienced over the last few million years as the region’s connectivity to the Indian Ocean has waxed and waned with changing sea levels. As a final word, do keep in mind the ultimately large size and predatory nature of E. leucogrammicus before considering purchasing one, as the pretty little blue juveniles typically available are just a fraction of their mature size. Obviously, a fish with this kind of price tag isn’t something the average aquarist is going to consider, but, if you do happen upon one that’s within your budget, be sure you can offer it a suitably large aquarium of 150 or more gallons. UPDATE: Dr. Luiz Rocha, who has studied this fish extensively in its natural habitat, suggests that this large blue specimen may be an aberrant individual, as most observed specimens lose the blue coloration beyond 10cm. 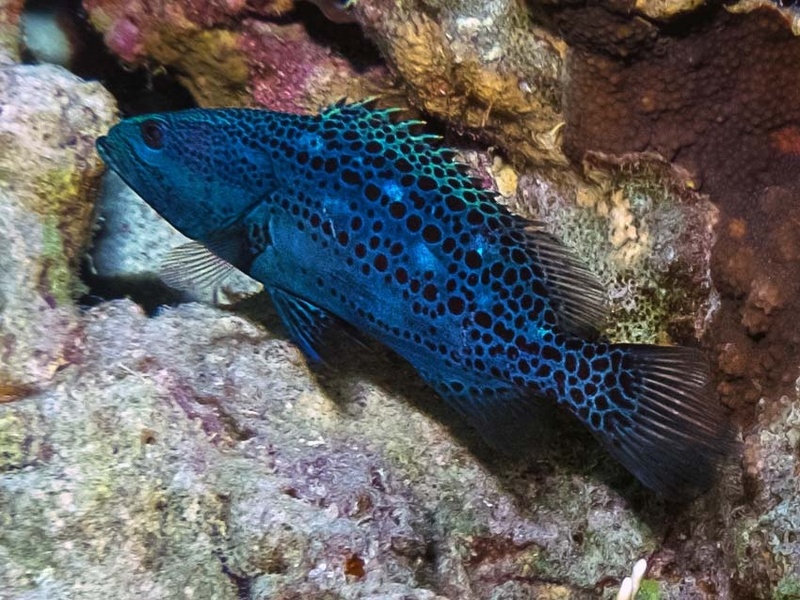 He also suggests that the juvenile coloration is meant to mimic the Fourline Cleaner Wrasse (Larabicus quadrilineatus), which does indeed look remarkably like this grouper. 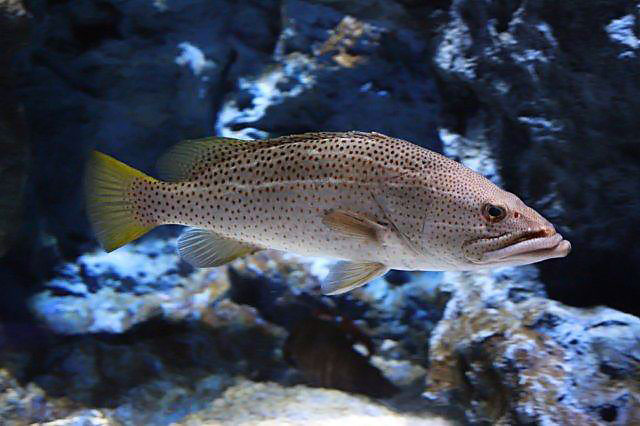 Interestingly, he goes on to mention that juveniles of this grouper observed in Eastern African, where neither of the normal mimicry models exists, instead resemble Halichoeres cosmetus! Hopefully these aren’t like golden coney groupers that turn to their species normal brown color after a bit in captivity. I took the picture at the top of this article in the Red Sea back in May this year. 2 weeks ago, I was back there diving the in the same places and on the last dive of the trip, I saw another one. I had a bit longer to watch this one so managed to get a couple of pictures. As with the earlier one, I found this little guy in less than 15m (45ft). I’d need to check my dive logs to confirm if it was the same location or not.